Unfortunately, sometimes business partnerships, just like marriages, fail. It's almost certain that partners will disagree about their respective entitlements after the split unless a Partnership Agreement is in place. If you have run into trouble with your partner or the business has ceased to trade, then a Partnership Dissolution agreement will set out how the business assets or net liabilities will be divided between the partners. 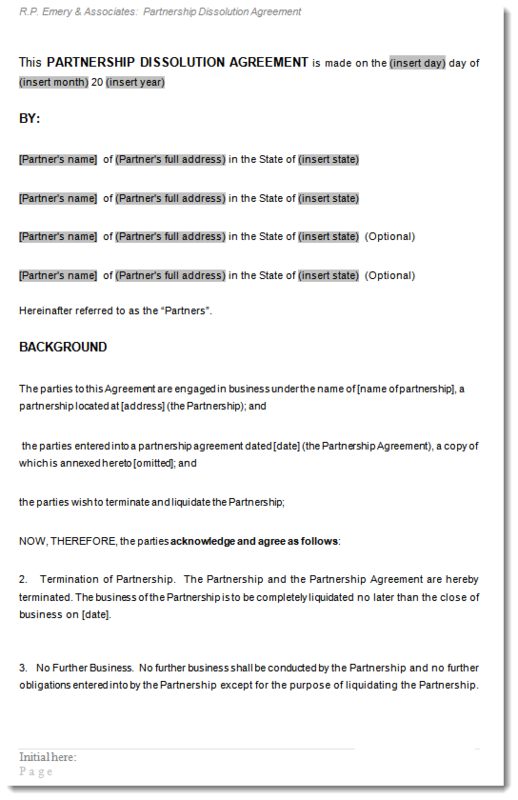 You use this Agreement when you wish to formalise the ending of a business partnership. The partnership agreement sets out what should happen when the partnership is functioning well but it also looks at what should happen if there is a falling out or if a partner dies and so forth. The dissolution agreement acknowledges the partnership has come to an end and the parties either agree to let the dissolution be governed by the existing partnership agreement or they set out how things will be wound down in a new document. If there is no partnership agreement to guide the dissolution then this contract will provide the guidance and document the agreement between the partners. 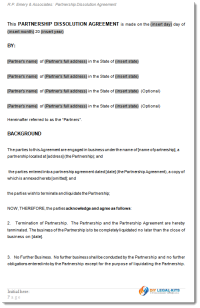 This professionally drafted, Partnership Dissolution Agreement is available for immediate download. It is provided to you as a Word document is easy to edit. that can be used as often as you like. Simply insert the correct information, Save and Print. Our fully secured ecommerce system allows you to purchase and download your Dissolution of Partnership Agreement safely and with complete peace of mind. In just a few minutes you can have everything you need create a professional and legal agreement.